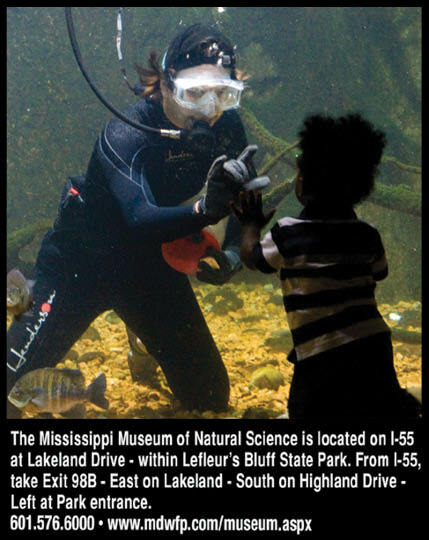 Visit the Mississippi Department of Wildlife, Fisheries, and Parks’ Museum of Natural Science at the intersection of I-55 and Lakeland Drive. The Museum is located on Lefleur’s Bluff surrounded by beautiful woodland, swamp, and riverine landscapes. Visitors will be greeted with exhibits featuring native wildlife and waterfowl, dioramas of Mississippi’s terrestrial ecosystems, and numerous large aquariums. Our aquariums hold over 100,000 gallons of water and showcase inhabitants of the Mississippi Sound, the Pearl River, and many other aquatic habitats throughout the state. In addition, the Museum offers a 200 seat auditorium, two classrooms, a preschool room, a gift shop, an exhibit hall for travelling exhibits, laboratories, collection ranges, and 2.5 miles of majestic hiking trails. For more information on educational programs, field trips, camps, or events, please call 601-576-6000 or visit our website at www.mdwfp.com/museum. The Museum provides teacher education training through active, hands-on workshops. These workshops are interdisciplinary conservation and environmental education programs emphasizing wildlife. The programs are designed for educators of kindergarten through twelfth grade. The workshops are 6 hours and are approved by the State Department of Education for CEUs. Call the education staff at (601) 576-6000 for more information on these and other educational programs.